we are close to a month into the endurance phase of Comrades training and it is a great time to review where you are and what your Comrades potential is, so that the final month of endurance work can be tailored to your current ability. 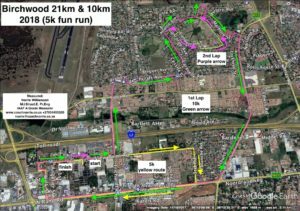 This make the Birchwood 10k / 21km an ideal opportunity for Gauteng runners to test their “Capacity” over the flat fast Birchwood Half Marathon and 10km course. The race commences at the massive Birchwood Conference Centre on Viewpoint road at the southern end of the OR Tambo runway, so not surprisingly the area has minimal hills, and those that do exist are gradual. The pacing charts provided take account of these inclines and drops, making it easy to pace your way to a flat out race situation. The following provide the opportunity for elite racers to go for a event record. Why is it so good to have the fast flat 10k or 21km race in this final build up to Comrades. The fact is that your potential Comrades finish is determined first and foremost by your ability over the shorter distance. It is not a coincidence that the winners, and silver medallist come from those who can run a 10km faster than 31 minutes (gold men) and sub 40 minutes (silver). No matter how much distance a 45 minute 10km runner does you will not find them in the silver medals! A sub 90 for half marathon gives an outside chance of a silver, and a sub 70 minute 21km could see a runner squeezing into the Golds (men). The Golden women generally require better than 89 minutes for the 21km and sub 39 for 10km, but much depends (for the last gold in men and women) on the quality and depth of the field and how runners fair during the race. The two other components of this equation are: solid endurance training, and great race strategy on race day. This can be covered later and closer to the race day. For now it is vital that every runner take the opportunity to determine their current ‘status’ – where does your current ability place you in terms of potential comrades finish? 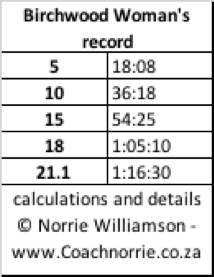 For instance a runner who is not capable of breaking 63 minutes for 10km is truly on a knife edge to completing Comrades in the 12 hour time limit. Such as runner could well gain much more by reducing the number of slow endurance runs and increasing the time of improving speed over the next 4 weeks. Doing more distance will do little to improve a runner who is capable of squeezing in for a 5 hour marathon qualifier, as it is more likely that the runner will be tiring the legs rather than building potential. 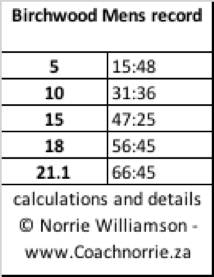 If that runner can know 2 minutes from the 63 minute 10km they will put themselves into the 11:30-11:40 potential and that takes a bit more of the pressure off, particularly given the 11 minutes or so that can be lost at the start of the Comrades, and the slowing as the road narrows at ‘Market’ on the back of Polly Shortts. In summary : use the next opportunity of a short fast flat out race to check progress and that your training matches your current Comrades target, then based on the result you can readjust as necessary and start your detailed race planning and pacing for 10 June.